I was gl ad to see Jeff Bridges get the Oscar nod for Crazy Heart; I enjoyed his performance very much. Many scenes in the film were shot in Albuquerque, where I live, and occasionally I found the familiar locations a bit distracting. One scene takes place in the parking lot of a bar just a few blocks from my home, a big concert scene that is set in Arizona was shot in an amphitheater on the outskirts of Albuquerque, a venue where I saw Bob Dylan and Willie Nelson last summer. That evening, through the clouds of incense smoke, I spotted Dylan's Oscar for "Things Have Changed," from the movie The Wonder Boys on an amplifier behind him. A film that Jeff Bridges and Bob Dylan were both in that nobody got any Oscars for was Dylan's Masked and Anonymous. While it may not be a critic's favorite it is a film I that I've watched again and again and have spent quite a bit of time studying. In the film Bridges plays Tom Friend, a troubled reporter. The bonus features on the Masked and Anonymous DVD include an interesting deleted scene featuring Bridges, it is a shame that it isn't in the film as it is a powerful performance. Bridges delivers this monologue: "I grew up on a farm. I slept with the cows. My old man broke his leg, became addicted to drugs, then he became a missionary. We had nothing against rats, but we used to have to shoot them because they'd eat the potatoes and flour. If rats were like frogs and ate water and mud, we would have left them alone. Then we lived in a mobile home park. We lived in a Prowler next to a Holiday Rambler and the Nomad. I had a baby horse. It meant everything to me. I wouldn't have traded it for a racehorse. The saddle was so small you could've put it on a cat. My old man, he went down the tunnel of love, the dark ride. It was the only way he could go. At carnival time, everybody had to put on a mask, and you had to eat and drink through your mask. Somebody brought be what I thought was eggs and home fries, and I gobbled it down. Then somebody told me later I'd eaten the flesh of my old man." The bolded passages are there to illustrate how those lines are crafted out of material from a book of sideshow photography called In Search of the Monkey Girl. The book features photos by Randal Levenson as well as an essay called "Stories From The 1981 Tennessee State Fair" by Spalding Gray. Dylan's interest in sideshow is deep, something that I wrote about at length in a post last year. "Maurice started in. He said he was of French-Canadian descent, from Burlington, Vermont, and his father had worked for IBM and broken his leg and become addicted to very strong drugs, painkillers the doctor had given him that were too strong, and the father actually died from this addiction. He was also very pessimistic, and the boys had buried him; they had thrown the dirt in on the grave. After that, Maurice had gotten into taking a lot of LSD; he had taken well over seventy trips, so this was an autobiographic sideshow. 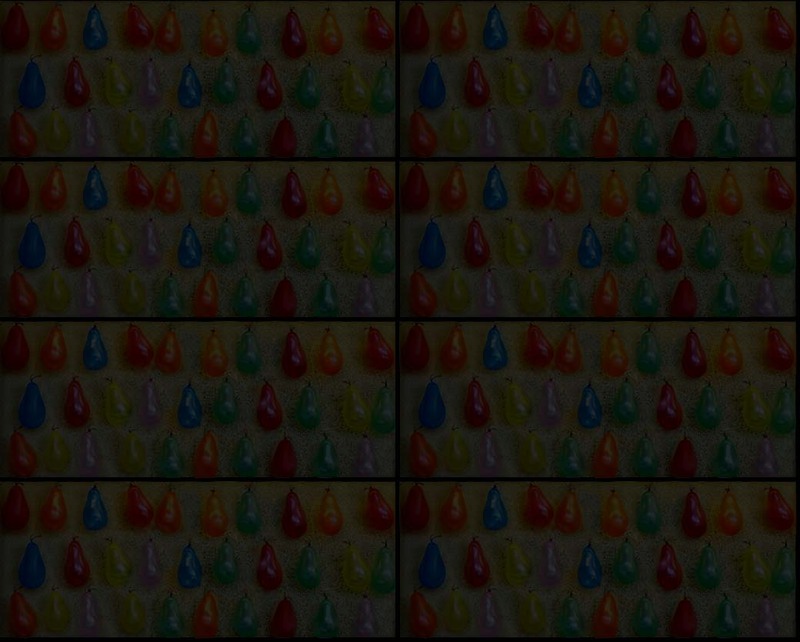 And he always went for the clear light. Now he got involved with this Catholic order, the Maryknoll order, and he had been a missionary in Africa, and he got thrown out of the Maryknoll order, because he was involved in sedition, and he decided to become a more conservative minister and went to the Princeton Seminary to study the ministry." "Most of the carnival people seemed to be from Montgomery, Alabama, and all of them lived in different trailers-mobile homes called the Blazer, the Prowler, the Wolverine, the Nomad, the Holiday Rambler, the Free Spirit." "He started smoothing back his hair, telling me, 'I bet you've never seen hair like this. I'm seventy-six years old and I've still got all my hair. I've been riding boxcars most of my life, sleeping on cardboard boxes. And I finally came into a gold mine Tiny Tina. I wouldn't trade her for a racehorse..."
"As we were talking the Tiny Tina man got out a little teeny saddle. It was so darling a little leather saddle so small you could put it on a cat." "This fellow ran the dark ride, a ride like the tunnel of love, and he never took off the mask; he ate through it, drank through it." "Late one night in Minot, the show had closed and I was tired and hungry. The only places to eat on the grounds were the old slaughteryard and the grab joints, so I went into town to the diner, the only spot that wasn't closed up for the night. I ordered the safe thing � eggs and home fries � and then Virginia came in and ordered a couple of hamburgers to go. We talked a little about the day, and then I said, 'Where's Bob?' She said, 'Oh, he's out in the car.' I was going to ask, 'Why doesn't he come in? ', but then I realized he couldn't come in, not because he'd give away his act, but because he would alarm people in the restaurant. There they were, worn out after a long day. He couldn't go inside and she was going to have to go back to the trailer and put one of those burgers through the blender, but they were going to eat well and they were going to eat together. That's when I began to understand what the two of them had with each other." What I find fascinating about the passage above is that Levenson describes the eggs and home fries as "the safe thing" and in Masked and Anonymous that meal has become human flesh; the least safe, most taboo thing one could possibly consume. Masked and Anonymous includes other material that appears to be drawn from In Search of the Monkey Girl. Mickey Rourke's character Edmund delivers these lines to Dylan's character Jack Fate: "You know how it is Jack. When inferior people want to revolt, they do. And when they become equal they want to be superior. You're looking at the top man now, Jack. It's no dog and pony show. We're not just some macho men from the flea market." "I could make a lot of money at Washington Square when I got back. Or I could go down to Canal Street to the flea market. I'd wear sunglasses. It would be a good chance to make fun of macho men." In the film Jack Fate encounters a Man-Eating Chicken sideshow act, an act that is featured prominently in Gray's essay. In the script for Masked and Anonymous there is a scene where Jack Fate encounters a blind man, clearly Oedipus, who rants about Freud slandering him. The blind man goes on and on about Freud's cocaine use and some of his dialogue is constructed out of Levenson's notes for his photo "'Go-go Coaster' Inland Empire, Shelby, Montana, 1976." In a featurette on the DVD Larry Charles, the director and co-writer of Masked and Anonymous, mentions how he told the cast to treat the script as a treasure map. There are indeed many interesting things buried in the script. If you know where to dig you will find elements from Naked Lunch, a couple of August Strindberg plays, Jim Bouton's Ball Four as well as nods to novels by John Dos Passos, Kenneth Patchen, Paul Auster and a lot more. I am particular interested in how Dylan incorporated the elements regarding the tiny horse into the script. 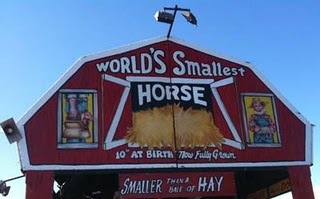 The World's Smallest Horse has been a staple of sideshow for decades. The bally used to pitch the horse always incorporates the same elements, but has transformed over time much the way that a folk song that is passed down changes over the years/decades/centuries. Usually the horse is pitched as being from "the wilds of Arizona," In Spalding Gray's essay the horse is from "the southwest wilds of Arizona." The line in the bally that I like the most regards what the horse eats. When I came across Tiny Tim, The World's Smallest Horse at the New Mexico State Fair last year the bally, a recording that played on an endless loop, included "just a shoebox of hay and a cup full of water makes a mighty big meal for Tiny Tim." I found a clip on YouTube with a field recording of the small horse bally for a different Tiny Tim that has the line as "just a handful of grain and a cup full of water is enough for Tiny Tim." Jim Zajicek of Big Circus Sideshow has his own take on this bally when he pitches "Little Biscuit" and Wayne Keyser's terrific CD Bally: Sounds of the Sideshow includes a recording of the little horse bally that must be over 40 years old that features all the classic elements. The same folk process that one observes when studying Child Ballad variants is in play when it comes to sideshow bally. There has been some interesting research on this topic, a 1983 article in The Journal of American Folklore by Amanda Dargan and Steven Zeitlin called "American Talkers: Expressive Styles and Occupational Choice" and the amazing companion set of recordings American Talkers: The Art of the Pitchman, available on iTunes, are good starting points, but it is an area that deserves much more exploration. Of particular interest on American Talkers: The Art of the Pitchman is a recording by the late John Bradshaw titled "Blow Off for Priscilla the Monkey Girl." 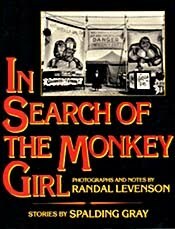 Bradshaw is doing a pitch for the same monkey girl, Percilla Bejano, that Levenson was in search of. Wayne Keyser produces a po dcast called Ballycast and in a recent episode he touches on sideshow and the folk tradition. Keyser talks about some bally recorded for Hubert's Museum, a place Dylan writes about visiting in Chronicles: Volume One, and brings Harry Smith's Anthology of American Folk Music and Greil Marcus' The Old, Weird America into the discussion. I've listened to every episode of Ballycast, Keyser has done some fascinating interviews, but episode #035, "Hubert�s, Sideshow as Folk Art, & Lizard Men," is a good starting point for anyone interested in getting a better bead on how to approach Dylan's interest in sideshow as well as how folk music, oral tradition and sideshow bally dovetail.